Se debe cancelar con al menos 2 semanas de anticipación para no generar cargos. Cancelaciones fuera del plazo se cobra el 100% del valor de la reservación. Se deberá garantizar el 100% del valor de la reservación con una tarjeta de crédito válida. Cualquier modificación en el número de huéspedes causará cargos extras. Wedding groups and any other king of groups willing to stay at a convenient, clean and secure hotel. 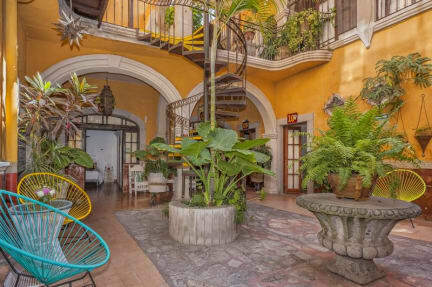 Hotel Casa Loteria is a B&B centrally located in an ancient building, a few steps from the main square of San Miguel de Allende. Originally the building was used for the Holly Inquisition purposes and maintain its characteristic architecture of arches and stone floors. Through about 200 years the place has been adapted to be a fully functional hotel with all the facilities to provide a comfortable stay for all our guests. Our hotel it´s surrounded by many bars, restaurants, art galleries and shops. All the main touristic spots are near our place and can be reached on foot. San Miguel de Allende´s downtown is really charming by night and also secure if you want to walk late at night. In the structure we have 14 rooms and we can host up to 40 guests. Our Double Comfort rooms have one Double Bed and private bathroom. This type of rooms are located on the lower part of the hotel and they have a view on the central patio. The Double Superior rooms with 1 Extra large Double Bed and private bathroom are located in the lower and upper part of the building. Some of them have a balcony with view on the street. 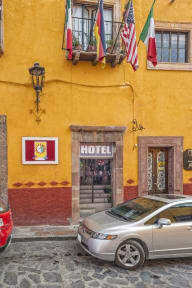 If you are travelling with friends we suggest booking our Quadruple Room with 2 Double Beds and private bathroom the best deal to enjoy San Miguel. All of our rooms include bathroom amenities, bottle of water on your arrival, towels and sheets. We also offer a delicious breakfast in the restaurant in front of our hotel for only 5 USD. Payment upon arrival by cash, credit cards, debit cards (Visa and MasterCard) - This property may pre-authorise your card before arrival. Breakfast not included - 75 MXN per person per day. In order to proceed with your reservation we require valid credit card. The remaining amount of the reservation will be preauthorized. In order to pre-authorize the credit card the property may need the CVC code. In order to get the CVC code they will contact you. Please come back to them with the information they need within 72h or your booking will be cancelled.